This is a purely sentimental entry. 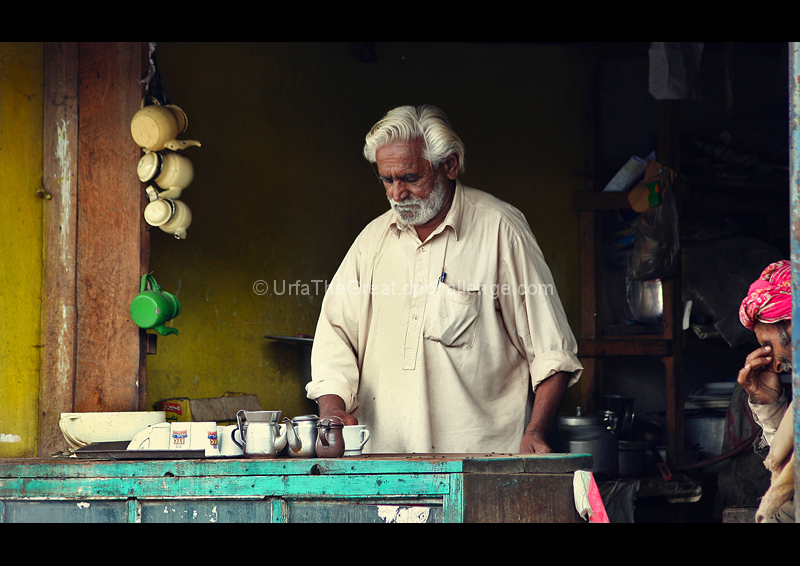 I go hiking every year and I see this teashop on the way with the same white haired man. I take his picture every time. I am such a stalker. lol! The composition could be better but the road is narrowish, obviously if I'm noticed with my camera it's not possible to get a candid and I wouldn't have caught the pink turban guy who for me makes the picture. Front page I was right, nice one. I disagree. the composition is perfect. Great image -- beautiful light. Congrats on the nice finish. Wonderfully done! Congrats on top ten. I feel like I'm there. Congrats on the top 10. I like the slightly muted tones a lot, very national geographic old style. Lovely light, and a wonderful capture. I like this, I didn't understand the title until I noticed the fellow on the right. Beautiful colors and soft light. I wish there was a bit more of the fellow on the left, he really draws the eye, but this is well rendered, top five. Very interesting photo, too bad you weren't able to get more of the guy on the right. Well seen, front page for sure. love the seemingly selective color. such a perfect slice of life. Had the chap with the 'headache' been a little further into frame this could have easily earned a mark or two extra. Great colours. Proudly hosted by Sargasso Networks. Current Server Time: 04/24/2019 01:49:36 AM EDT.